The Noka E71 is probably the best Nokia (smart) phone I ever laid my hands on. And I have to admit that I hated Symbian based phones in the past... the communicator series, etc. They were slow, hard to use, had a bad form factor (ok, that's not really related to Symbian), and so forth. It has an excellent form factor. not just „ POP over IMAP“, but the phone client and the server actually stay in sync. Gmail, Gmaps, Skype (via fring), flickr-upload work amazingly well for a phone. The tiny QWERTZ (the german layout for QWERTY) keyboard does work well. Better than the virtual keyboards on iPhone and friends. its predecessor, the E61i had the concept of access point groups , where you could group e.g. your home Wifi, your office Wifi and your 3G connections (i.e. access points) into one group, and then assign this access point group e.g. to your email connection settings. So email retrieval would work on any of those networks, but go over the faster and cheaper Wifi first. 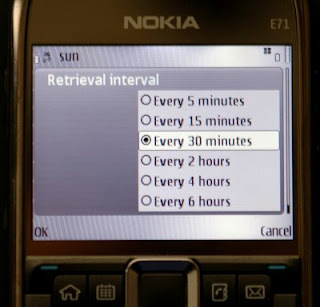 No longer possible with the E71. Automatic email retrieval is a cool thing, but can you spot the missing item here ? Why - oh why - just not every (1) hour ? I can no longer schedule a call in the calender. That's really a loss to me... I used that feature a lot for “scheduled call backs”. I still can set a reminder of course, but there is a lot more typing involved – both when entering the reminder as well as later when doing the call. It used to be just one click (on the green button).